All MPS families and community members are invited to attend a very important meeting of the District Advisory Council (DAC) on Thursday, February 1. The District Advisory Council is made up of MPS family members and community members representing schools from across the district. The DAC meets on the first Thursday of each month to discuss important issues and decisions facing Milwaukee Public Schools. This week, the DAC will discuss the Children’s Savings Accounts initiative being proposed by the City of Milwaukee. A team from P3 Development will lead discussions on this new initiative. The feedback they gather will help develop the Children’s Savings Account program. The meeting will also include an important presentation on the MPS district budget to help families better understand the budget process currently underway at MPS Central Services and at each school. The DAC invites you to attend on Thursday, February 1 from 5:30 to 7:30 p.m. at MPS Central Services, 5225 W. Vliet St., Milwaukee. • Refreshments are served from 5:30 to 6 p.m. in the lower level cafeteria. • The meeting will begin at 6 p.m. in the auditorium. • Free childcare is available during the meeting for children who are toilet trained. • Interpretation in Spanish is provided. 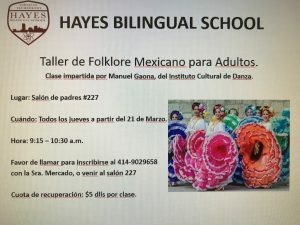 If you require another language, please email dac@milwaukee.k12.wi.us.